A sage is someone who can put into words the aspects of our mysterious nature that most of us can only feel. At times in my life I have been overwhelmed by the world and confused about the purpose of it all. I spent much time in anguish, behaving in self-destructive ways, wondering why happiness was so elusive. In this struggle, I passed many years looking outward for the source of turmoil in my world, trying to tweak, upgrade and replace parts of my life that seemed culpable for my sorrows; a different job, new friends, more education, better stuff. This always led me back, of course, to where I started, still confused, still unsatisfied, still searching for someone and something to blame. Words are more than just the sum of their meaning, they are powerful incantations, capable of conjuring up great inspiration or of casting damning spells. Philosophy is something that can heal, yet no doctor can prescribe it and no one can predict which words a person must hear to break through to a better place in life. The potent words of the great Indian philosopher Jiddu Krishnamurti fell into my life at precisely the right time, ringing true enough in my mind and in my heart to carry me to brighter days. Until then, no other spokesman of truth had challenged me so bluntly to take personal responsibility for everything that is wrong in my life and everything that is misaligned in the world, pointing out so truthfully that the world is as we create it. None other had demanded so fervently that I look deep within for the answers to suffering, pointing out the inattention I was giving to my own life. No one else had challenged everything I thought I knew about my personal history and my culture, exposing the conditioning of my own mind, compelling me to change. 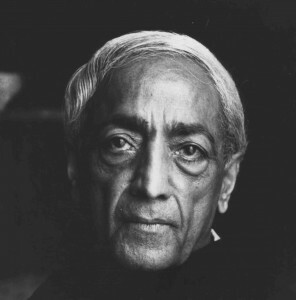 And for this I share with you these 17 Krishnamurti quotes that will turn your world view outside in, urging you to reconsider your culture religion, politics and family, guiding you towards a new awareness, intelligence and the truest freedom. Mostly taken from his public talks in the late 1960’s, these quotes have the power to unleash us from our chains and set us free into a powerful new present where our humanity can finally reign supreme over our fearfulness. I hope you find solace in them as I have, and that you share them with those whom you love, stirring within them the deep truths that can liberate us from the pitfalls of our own consciousness and the fabrications of our culture. 1. Our minds are conditioned – that is an obvious fact – conditioned by a particular culture or society, influenced by various impressions, by the strains and stresses of relationships, by economic, climatic, educational factors, by religious conformity and so on. Our minds are trained to accept fear and to escape, if we can, from that fear, never being able to resolve, totally and completely, the whole nature and structure of fear. So our first question is: can the mind, so heavily burdened, resolve completely, not only its conditioning, but also its fears? Because it is fear that makes us accept conditioning. 2. I wonder why we divide life into fragments, the business life, social life, family life, religious life, the life of sport and so on? Why is there this division, not only in ourselves but also socially – we they, you and me, love and hate, dying and living? I think we ought to go into this question rather deeply to find out if there is a way of life in which there is no division at all between living and dying, between the conscious and the unconscious, the business and social life, the family life and the individual life. 3. Man has always sought immortality; he paints a picture, puts his name on it, that is a form of immortality; leaving a name behind, man always wants to leave something of himself behind. What has he got to give – apart from technical knowledge – what has he of himself to give? What is he? You and I, what are we, psychologically? You may have a bigger bank account, be cleverer than I am, or this and that; but psychologically, what are we? – a lot of words, memories, experiences, and these we want to hand over to a son, put in a book, or paint in a picture, ‘me’. The ‘me’ becomes extremely important, the ‘me’ opposed to the community, the ‘me’, wanting to identify itself, wanting to fulfill itself, wanting to become something great – you know, all the rest of it. When you observe that ‘me’, you see that it is a bundle of memories, empty words: that is what we cling to; that is the very essence of the separation between you and me, they and we. 4. How is the mind, the brain included to be completely quiet? Some say breathe properly, take deep breaths, that is, get more oxygen into your blood; a shoddy little mind breathing very deeply, day after day, can be fairly quiet; but it is still a shoddy little mind. 5. We look at conditions prevailing in the world and observe what is happening there – the student’s riots, the class prejudices, the conflict of black against white, the wars, the political confusion, the divisions caused by nationalities and religions. We are also aware of conflict, struggle, anxiety, loneliness, despair, lack of love, and fear. Why do we accept all this? Why do we accept the moral, social environment knowing very well that it is utterly immoral; knowing this for ourselves – not merely emotionally or sentimentally but looking at the world and at ourselves – why do we live this way? Why is it that our educational system does not turn out real human beings but mechanical entities trained to accept certain jobs and finally die? Education, science and religion have not solved our problems at all. Looking at all this confusion, why does each one of us accept and conform, instead of shattering the whole process in ourselves? 6. This is a very human, ordinary problem, which touches the life of everyone of us, rich and poor, young and old, why do we live this monotonous, meaningless life, going to the office or working in a laboratory or a factory for forty years, breeding a few children, educating them in absurd ways, and then dying? I think you should ask this question with all your being, in order to find out. Then you can ask the next question: whether human beings can ever change radically, fundamentally, so that they look at the world anew with different eyes, with a different heart, no longer filled with hatred, antagonism, racial prejudices, but with a mind that is very clear, that has tremendous energy. Seeing all this – the wars, the absurd divisions which religions have brought about, the separation between the individual and the community, the family opposed to the rest of the world, each human being clinging to some peculiar ideal, dividing himself into ‘me’ and ‘you’, ‘we’ and ‘they’ – seeing all this, both objectively and psychologically, there remains only one question, one fundamental problem and this is whether the human mind, which is so heavily conditioned, can change. Not in some future incarnation, nor at the end of life, but change radically now, so that the mind becomes new, fresh, young, innocent, unburdened, so that we may know what it means to love and to live in peace. 7. To deny conventional morality completely is to be highly moral, because what we call social morality, the morality of respectability, is utterly immoral; we are competitive, greedy, envious, seeking our own way – you know how we behave. We call this social morality; religious people talk about a different kind of morality, but their life, their whole attitude, the hierarchical structure of religious organization and belief, is immoral. To deny that is not to react, because when you react, this is another form of dissenting through one’s own resistance. But when you deny it because you understand it, there is the highest form of morality. In the same way, to negate social morality, to negate the way we are living – our petty little lives, our shallow thinking and existence, the satisfaction at a superficial level with our accumulated things – to deny all that, not as a reaction but seeing the utter stupidity and the destructive nature of this way of living – to negate all that is to live. To see the false as the false – this seeing is the true. 8. If people who say they love their children meant it, would there be war? And would there be division of nationalities – would there be these separations? 9. If the mind is unconditioned it is free. So we are going to find out, examine very closely, what makes the mind so conditioned, what are the influences that have brought about this conditioning, and why we accept it. First of all, tradition plays an enormous part in life. In that tradition the brain has developed so that it can find physical security. One cannot live without security, that is the very first, primary animal demand, that there be physical security; one must have a house, food, clothing. But the psychological way in which we use this necessity for security brings about chaos within and without. The psyche, which is the very structure of thought, also wants to be secure inwardly, in all its relationships. Then the trouble begins. There must be physical security for everybody, not only for the few; but that physical security for everybody is denied when psychological security is sought through nations, through religions, through the family. 10. Then there is the question of dying, which we have carefully put far away from us, as something that is going to happen in the future – the future may be fifty years off or tomorrow. We are afraid of coming to an end, coming physically to an end and being separated from the things we have possessed, worked for, experienced – wife, husband, the house, the furniture, the little garden, the books and the poems we have written or hoped to write. And we are afraid to let all that go because we are the furniture, we are the picture that we possess; when we have the capacity to play the violin, we are that violin. Because we have identified ourselves with those things – we are all that and nothing else. Have you ever looked at it that way? You are the house – with the shutters, the bedroom, the furniture which you have very carefully polished for years, which you own – that is what you are. If you remove all that you are nothing. And that is what you are afraid of – of being nothing. Isn’t it very strange how you spend forty years going to the office and when you stop doing these things you have heart trouble and die? You are the office, the files, the manager or the clerk or whatever your position is; you are that and nothing else. And you have a lot of ideas about God, goodness, truth, what society should be – that is all. Therein lies sorrow. To realize for yourself that you are that is great sorrow, but the greatest sorrow is that you do not realize it. To see that and find out what it means is to die. 11. Can you observe anything – a tree, your wife, your neighbor, the politician, the priest, a beautiful face – without any movement of the mind? The images of your wife, of your husband, of your neighbor, the knowledge of the cloud or of pleasure, all that interferes, doesn’t it? So when there is interference by an image of any kind, subtle or obvious, then there is no observation, there is no real, total awareness – there is only partial awareness. To observe clearly there must be no image coming in between the observer and the thing observed. When you look at a tree, can you look at it without the knowledge of that tree in botanical terms, or the knowledge of your pleasure or desire concerning it? Can you look at it so completely that the space between you – the observer – and the thing observed disappears? That doesn’t mean that you become the tree! But when that space disappears, there is the cessation of the observer, and only the thing which is observed remains. In that observation there is perception, seeing the thing with extraordinary vitality, its color, its shape, the beauty of the leaf or trunk; when there is not the center of the ‘me’ who is observing, you are intimately in contact with that which you observe. 12. If I think I am very beautiful and you tell me I am not, which may be a fact, do I like it? If I think I am very intelligent, very clever, and you point out that I am actually a rather silly person, it is very unpalatable to me. And your pointing out my stupidity gives you a sense of pleasure, does it not? It flatters your vanity, it shows you how clever you are. But you do not want to look at your own stupidity; you want to run away from what you are, you want to hide from yourself, you want to cover up your own emptiness, your own loneliness. So you seek out friends who never tell you what you are. You want to show others what they are; but when others show you what you are, you do not like it. You avoid that which exposes your own inner nature. 13. Real freedom is not something to be acquired, it is the outcome of intelligence. You cannot go out and buy freedom in the market. You cannot get it by reading a book, or by listening to someone talk. Freedom comes with intelligence. But what is intelligence? Can there be intelligence when there is fear, or when the mind is conditioned? When your mind is prejudiced, or when you think you are a marvelous human being, or when you are very ambitious and want to climb the ladder of success, worldly or spiritual, can there be intelligence? When you are concerned about yourself, when you follow or worship somebody, can there be intelligence? Surely, intelligence comes when you understand and break away from all this stupidity. So you have to set about it; and the first thing is to be aware that your mind is not free. You have to observe how your mind is bound by all these things, and then there is the beginning of intelligence, which brings freedom. You have to find the answer for yourself. What is the use of someone else being free when you are not, or of someone else having food when you are hungry? To be creative, which is to have real initiative, there must be freedom; and for freedom there must be intelligence. So you have to inquire and find out what is preventing intelligence. You have to investigate life, you have to question social values, everything, and not accept anything because you are frightened. 14. Have you ever thought about why you are being educated, why you are learning history, mathematics, geography, or what else? Have you ever thought why you go to schools and colleges? Is it information, with knowledge? What is all this so-called education? Your parents send you here, perhaps because they themselves have passed certain examinations and taken various degrees. Have you ever asked yourselves why you are here, and have the teachers asked why you are here? Do the teachers know why they are here? Should you not try to find out what all this struggle is about – this struggle to study, to pass examinations, to live in a certain place away from home and not be frightened, to play games well and so on? Should your teachers not help you to inquire into all this and not merely prepare you to pass examinations? 15. So religion becomes a matter of belief, and belief acts as a limitation on the mind; and the mind then is never free. But it is only in freedom that you can find out what is true, what is God, not through any belief; because your belief projects what you think God ought to be, what you think ought to be true. If you believe God is love, God is good, God is this or that, your very belief prevents you from understanding what is God, what is true. 16. A conditioned mind is not free because it can never go beyond its own borders, beyond the barriers it has built around itself; that is obvious. And it is very difficult for such a mind to free itself from its conditioning and go beyond, because this conditioning is imposed upon it, not only by society, but by itself. You like your conditioning because you dare not go beyond. You are frightened of what your father and mother would say, of what society and the priest would say; therefore you help to create the barriers which hold you. This is the prison in which most of us are caught, and that is why your parents are always telling you – as you in turn will tell your children – to do this and not do that. 17. Now, there are many people who will tell you the purpose of life; they will tell you what the sacred books say. Clever people will go on inventing various purposes of life. The political group will have one purpose, the religious group will have another, and so on and on. And how are you to find out what is the purpose of life when you yourself are confused? Surely, as long as you are confused, you can only receive an answer which is also confused. If your mind is disturbed, if it is not really quiet, whatever answer you receive will be through this screen of confusion, anxiety, fear; therefore the answer will be perverted. So the important thing is not to ask what is the purpose of life, but to clear away the confusion that is within you. It is like a blind man asking, “What is light?” If I try to tell him what light is, he will listen according to his blindness, according to his darkness; but from the moment he is able to see, he will never ask what is light. It is there.